Sophie “singing in the rain” | Curly's Corner Shop, the blog! 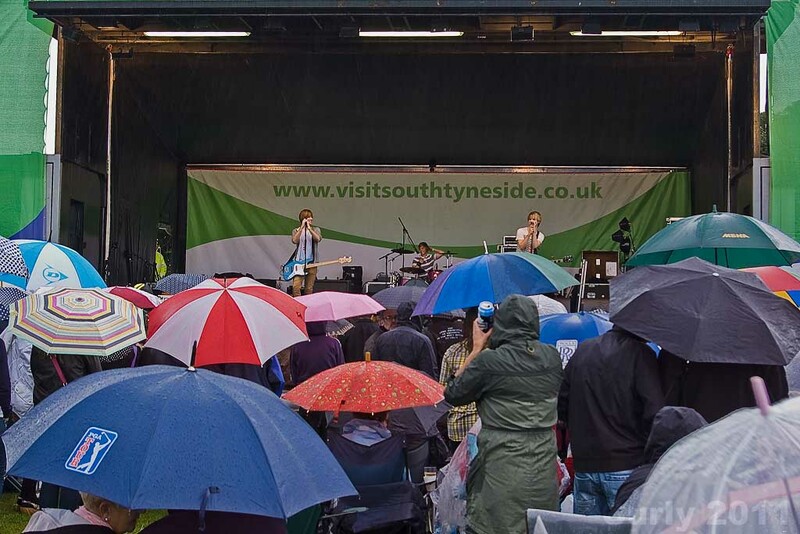 Well the weather ensured that today’s concert in the Bents Park, South Shields did not exactly enjoy a record attendance (that will come next Sunday) but a big healthy crowd was there under the cover of umbrellas to enjoy the music today. Intermittent showers became heavier downpours as families dressed for the occasion in waterproofs and sturdy shoes, some made do with carrier bags and bin liners, all manner of invention was used to keep dry. Myself……..well I wore a plastic poncho from Bunnings Warehouse in Brisbane, Australia, a gift courtesy of one of my ex-pat readers originally from South Shields, thanks a bunch Andy it kept me dry all the way down to the knees but the camera still suffered. 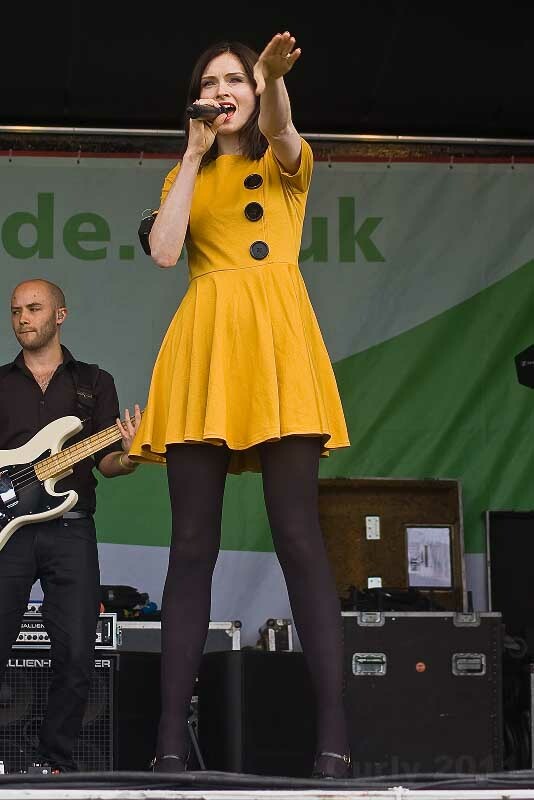 The unusual thing about today’s free concert was the large amount of youngsters attending, around the twelve to sixteen age group, I quickly understood why when three piece boy band Twenty Twenty took to the stage, they obviously have a large screaming following around here! Unusually for a boy band they actually play their own instruments, and very well too! 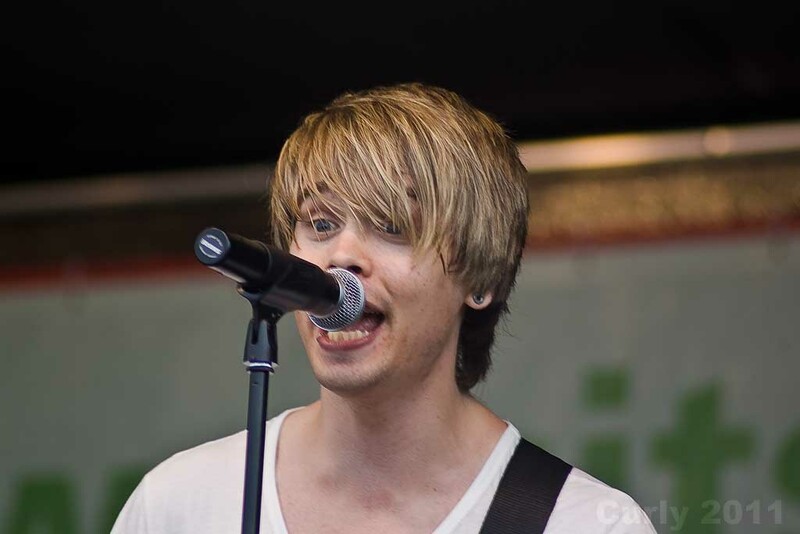 They have previously supported JLS, McFly, Selena Gomez, the Sugababes and The Saturdays on their recent UK tours. Some of their sounds reminded me a bit of Green Day but without the over hard edge, anyway the young girls approved in a way I hadn’t heard since the Beatles hit RFK Stadium in Washington, I guess we’d better keep an eye on these young lads who did a great job in getting the crowd warmed up for the main act of the afternoon. 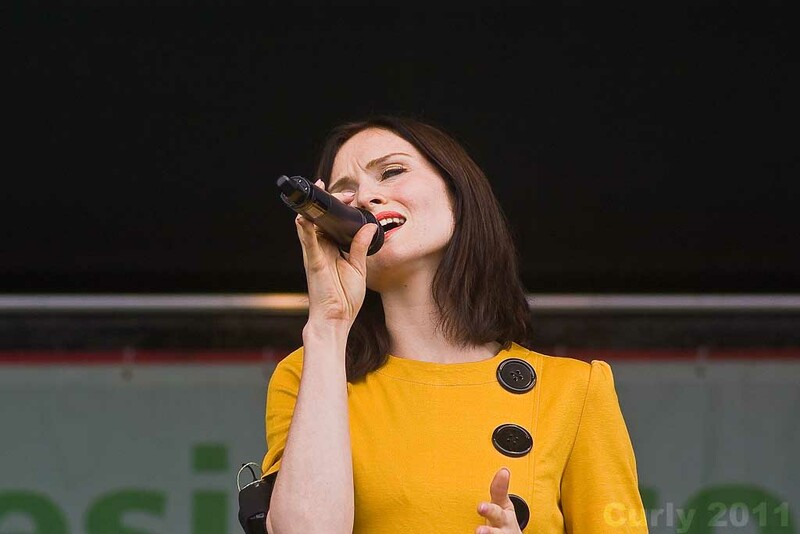 When Sophie Ellis Bextor arrived on stage she set the park alight, rather like a ray of sunshine which we all could have used, dressed in a couture yellow dress and black tights, she looked (to this writer) like the prettiest flower our parks had seen, her band had a tight sound as she bounced and flounced around the stage banging out her biggest hits. The 32 year old who hit the headlines first with a collaboration on Groovejet’s “If it ain’t love” showed no signs of suffering from any cold or throat infection as previously reported. After renditions of Get over you, Take me home, Music gets the best of me, Me and my imagination, and a few others we were treated to a complete Murder on the dance floor to send the soaked Sanddancers home. She made a real professional performance in the rain leaving everyone happy, I guess these events just wouldn’t have the same atmosphere if they were held indoors! For those who might have been there “councillor spotting” to see who might have been enjoying refreshment at the public expense I can say that those who I saw were outside getting drenched working hard raising money for local charities, and that included Mayor Jim Sewell and his wife Rosemary, as well as Cllr. 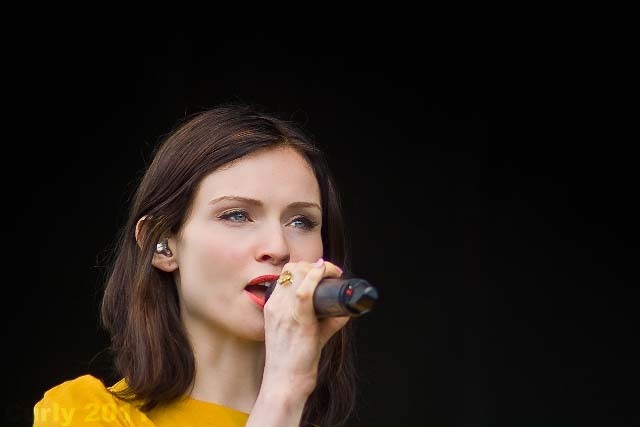 Faye Cunningham. And so we move on to next Sunday’s big event when South Shields very own Joe McCelderry will perform in the Bents Park, I predict a record attendance for this free event whatever the weather, parking will be scarce and so will be space in the park, so get down to South Shields early making best use of public transport if you can! 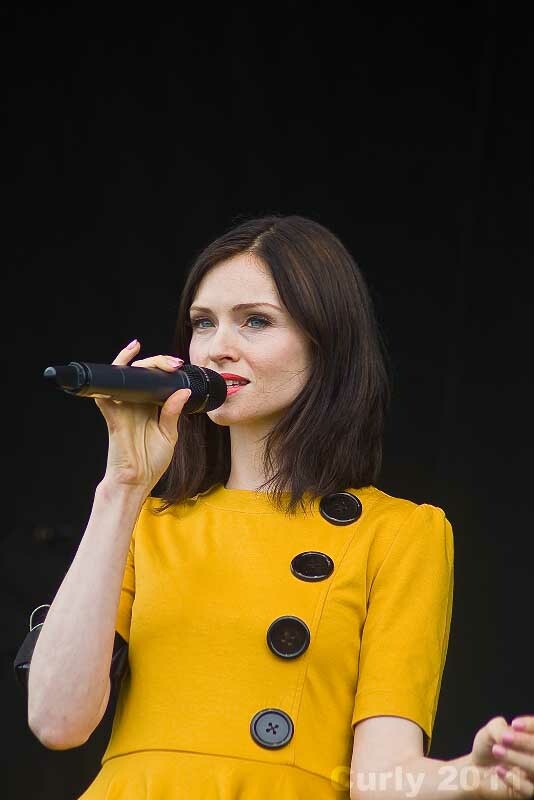 Gates open at 12:30 but you can be sure the queue will be huge hours before then, bring your chairs and tents and get ready for a spectacular in the Bents Park! I was told today that we got Joe at a bargain price because his star appeared to be waxing and waning at the time of his booking, that was long before the 2009 X Factor winner won ITV’s Popstar to Opera Star and signed a new record deal with one of Decca’s companies, so this may be the last opportunity for a long while to see Joe McCelderry perform for free on Tyneside. ps – any photographers out there who could help me out? Whilst shooting the first batch of pictures today I had no problems at all, then after changing from the standard lens to the telephoto and shooting in aperture priority all of my shots were at least four stops under exposed and virtually unusable. Despite changing aperture a few times the problem persisted, and even reverting back to the first lens did not help. It looked to me as though the lens diaphragm was not opening and closing but the short shutter speed was correct. Was it possible that a raindrop on the body had got between the fitting and the lens contacts and prevented correct operation? When I got home and dried the camera, everything was back to normal. « Call Tom Watson to the Select Committee too. Can’t help with the camera issue, but cool shots. Good to see bloggers political block has been replaced with singers, problems with pictures, festivals and ads for community forums, political issues relegated well down the page! Why is this, uncomfortable reading for the right maybe!! Kevin, most long time readers of this blog appreciate that I am proud to have been born and raised in South Shields, I love this town and its people and like to do whatever I can to promote those things which make us good. I like to promote those opportunities which arise to spark the imagination of our visitors and get them to return and spend their cash with us, I’ve been doing this for a number of years. Not a problem – “This blog relates to news, politics, and sporting events and how they affect my life and thinking in the North-East of England” (about section Curlys Corner Shop). As your readers intimate it is for those who contribute to decide if they wish to! Curly was out there in the rain doing what he does to help bring more tourists to Shields, and some of us who have moved away appreciate it and enjoy what he does he brings back happy memories.I’d love to come back more often but I now have a family in Derbys but please keep this website as it is Curly. Some people like to moan and denigrate the town too much. Were you sat in front of your telly watching the golf in the rain instead Kevin? During the time I have been reading Curly’s Corner Shop, it has always been a multi-subject blogsite and all festival gatherings have always received good coverage. If Kevin wishes to dictate what should appear or to criticise what is there in a blogsite, why doesn’t he start his own site and write whatever he wants to put on public view. I don’t know what he means by “uncomfortable reading for the right” but perhaps he might like to start up a thread based on the Blair/Brown relationship with the NI gang. I’m not sure about the comment re Coun Jimmy Sewell “working hard” to raise money for charity. I heard he spent most of his time propping up the bar!?! That certainly wasn’t true during the time that I was there, and he’s big enough NOT to miss. Well said, Curly, those of us who have knowledge of just how hard the majority of councillors work, get a bit fed up with jibes like the above, which could even be heading into Carter Ruck territory. Regrettably two warring councillors appear to have drawn attention to South Tyneside in a negative way,and, unfortunately, the virus seems to have spread to other “members of the public” who are tweeters, we don’t want it or need it on this site.The summer festival with its concerts and entertainments is a feather in the cap of South Tyne and deserves publicity in an apolitical way. I know that a lot of councillors (of all Parties) work hard for South Tyneside but I also know what I saw on Sunday. From hearsay to alleged primary evidence…Curly,needs to be careful what is published on this site regarding allegations about drinking and other habits of named individuals. Or, they may have “found God”! But, but….but….God is in Los Angeles, not Birmingham! Spotted in “leafy, sunny” Hertfordshire, St Alban’s Abbey awaits and John Bunyan country is near at hand, perhaps we are seeing a new “Pilgrim’s Progress”, a book which has never been out of print.